It’s been a busy week. WordPress is once again telling me to get with it, so here I go. 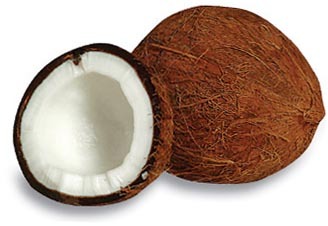 Just so happens I have a topic that I’ve never really written about before: the humble coconut. You’ve seen them in the grocery stores, thinking about buying one even, but wondering about cracking it open and extracting all the tasty bits. But there’s more to it than that twiggy, fuzzy exterior and white flesh. You might be familiar with the stuff you get in the baking aisle, too–but that’s got plenty of sugar in it, since it’s made for recipes like this one for Lamingtons, which, yes, I made many years ago. Know what? I gave my bud the GER some of them and I do seem to remember he enjoyed the heck out of them, as did the rest of the recipients. I do remember them being VERY tasty too. But I only made them once. I’ve mentioned before my new favorite sweet, Mounds bars with dark chocolate (not Almond Joy, which has milk chocolate), but I can’t say that I consume a LOT of coconut. I like it, but I can get sick of it, too. For a while I was making some coconut “cookies” with unsweetened coconut, beaten egg whites and SomerSweet, but I soon got sick of those, particularly since they tend to soften and get gummy if you let them sit for more than a day. But the dried stuff keeps in the pantry pretty well. This week, the esteemed Wall Street Journal ran a story on the benefits of coconut oil. The article called it “better than butter,” but really, that’s primarily if you’re allergic to milk, I think. I say that because both are healthy fats, and the only difference is lactose, or milk sugar, and the fact that butter must be refrigerated. So allergies not withstanding, what’s the difference, right? 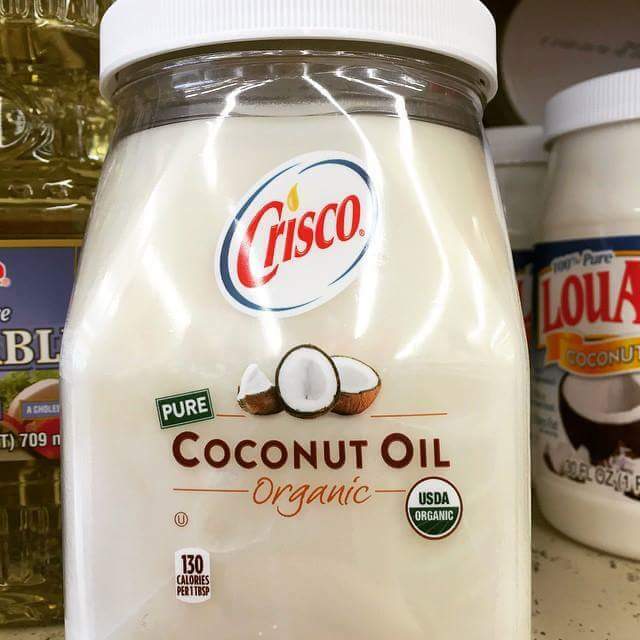 I was first introduced to coconut oil about ten years ago when I was living at the GER’s house. I forwarded him an article about something and there was a popup ad from Tropical Traditions, an online purveyor of oil from The Phillippines. He didn’t read the article–he thought I was asking him to buy some, pulled out his credit card and bought a five-gallon bucket of it! Back then it was $65, now it’s doubled in price. But it has a very long shelf life and a high smoke point like olive oil. Tropical Traditions also makes a number of different personal care products, including hair care. I know this because I got some last time I went to Dr. Davis’ office in The Woodlands. Trust me, you do NOT need much of it! No odor either, so you don’t smell like a tropical drink. You can also check out their recipe section for all kinds of ways to use coconut, coconut oil, and alternative versions of everyday foods. While I have not tried any of them yet, perhaps I need to go back and look at it again. I think it’s been a while. This one for flourless chocolate chip cookies looks good, but my guess is you’ll have to order the coconut cream concentrate from Tropical Traditions. 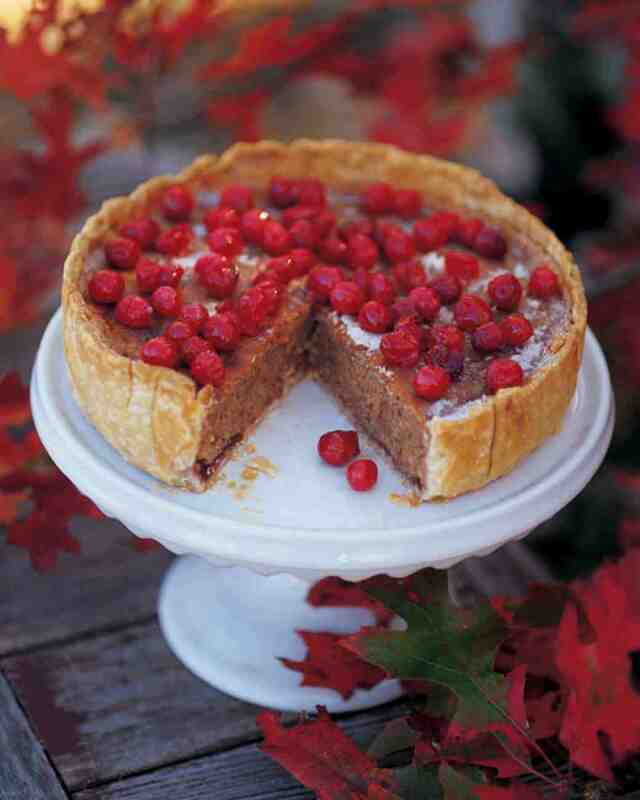 Chocolate Orange Truffle Pie? That might be good. There’s even a section of gluten free coconut recipes. I need to go look at that soon, too. This article really doesn’t tell a whole lot about coconut oil, just gives you a brief overview. But there’s so much more to coconuts. One thing you might not know is that coconut oil features prominently in Dr. Hotze’s Yeast Free Diet program for a couple of reasons. First, it’s plant based, so no milk sugar (lactose) to feed the yeast while you’re trying to kill it. Two, the health reasons stated in the article–medium chain fatty acids and all that. Third–something you might not know–is that coconut oil has anti-fungal properties that help with the killing of the yeast in your gut. (It also works in gluten-free cooking and baking, but more on that later.) So it’s healthy for a couple of reasons, not just the no-dairy thing. I am not dissing dairy. Far from it. 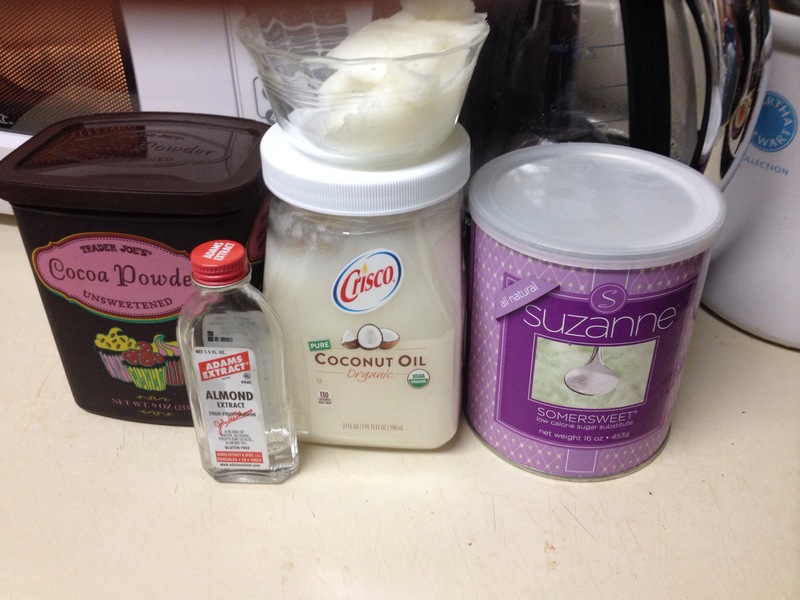 But if milk/dairy has you saying “shiver me timbers,” coconut oil can help you out. Yes, I know, unless you’re allergic to coconut. I’ve done the yeast-free diet many times. The first time had me swearing, because I was so hungry! But–that was because I didn’t have the instruction book and wasn’t ready for it. I know I need to do it when I start getting heartburn. I don’t GET heartburn from eating stuff like tomato sauce and chili. If you do have that problem, or other alimentary issues, consider it. And, actually, Dr. Hotze’s website has this quick primer on yeast overgrowth so you can learn more and see if it would work for you. It probably can’t hurt. I say that as someone who has done a couple of rounds of yeast free successfully; those prescriptions aren’t harmful, either. Anyway. . . . I can’t personally vouch for this, but there is a lady who began giving her husband coconut oil when he was diagnosed with Alzheimer’s. 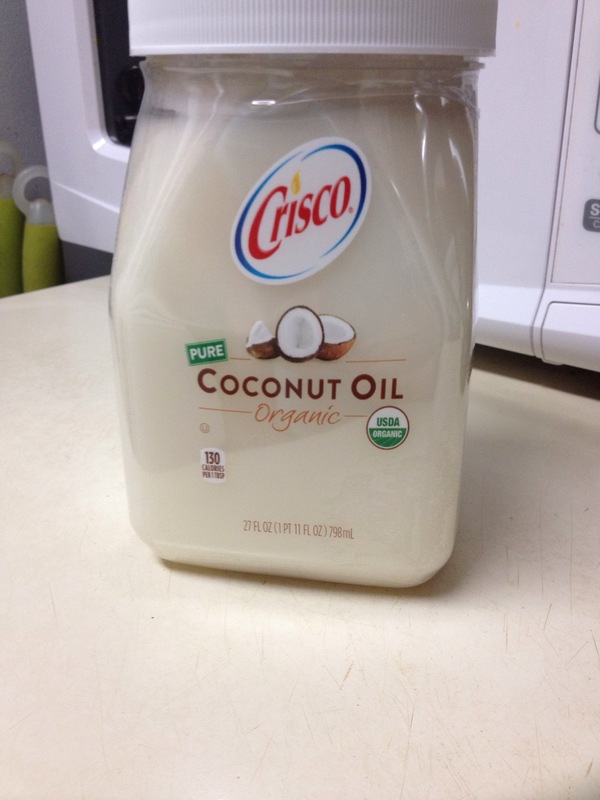 Dr. Mary Newport gave her husband coconut oil, and quickly improved. That’s not to say it’s a definite CURE for Alzheimer’s (or anything else, for that matter), but if you go to her home page and scroll down to the bottom, you’ll see her husband’s “clock test” and how he improved in 37 days from coconut oil. Unless you are allergic to coconut, this probably couldn’t hurt–but it’s a matter of using your own judgment. Remember, I’m not a doctor/nurse/medical person, just a patient who reads and pays attention. I only present information, and it’s up to you to review it before use. I present info because there might be one person somewhere who happens to read it and it was the very thing they were looking for. Happened to me once or twice, too. I’d forgotten about Dr. Newport until I read the comments in the WSJ article, which are quite interesting. (No funny stuff this time.) However, be forewarned that many doctors still ascribe to the “all fat is bad” mantra, which explains many modern illnesses. Don’t get me started. I don’t follow the “healthy new trends” anymore because many are bogus and none seem to be particularly helpful. I’m someone who used to eat white flour pasta because it was “healthy and low fat,” OK? Guess what? Healthy, it ain’t. Now, some time ago I bought a bag of coconut flour for one of the Babycakes recipes, and have only used it for a couple of things (including the infamous Pineapple Upside Down Cake.) One of my writer friends told me about a book specifically for coconut flour and gluten free stuff, called Cooking with Coconut Flour: A Delicious Low-Carb, Gluten-Free Alternative to Wheat by Bruce Fife. There is actually a second book by Bruce Fife, but I don’t yet have either one of them. 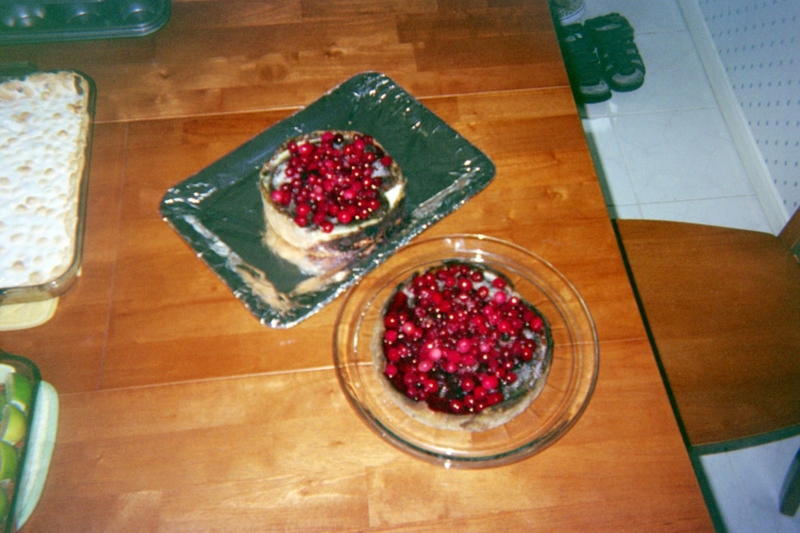 However, the friend raved about it, since she’s also diabetic, and interested in solutions. When I put the first book on my wish list, I also found this one, since I’m also a fan of almond flour. Oh, and there’s one by the same author for just cupcakes. I don’t have either one of those yet, either. One day. Oh, wait–this wasn’t supposed to be a gluten free blog post. It was supposed to be about coconuts. OOOPS. I have only once had a can of coconut milk in my pantry, used for a slow-cooker recipe from Everyday Food. It was a curry or something. Made it once, never again. I have also seen coconut water, but I dunno what that is or what it’s for. There are so many beverages with all kinds of things thrown in that I don’t want anything but a cup of tea, for heaven’s sake. Two different brands, two different prices. 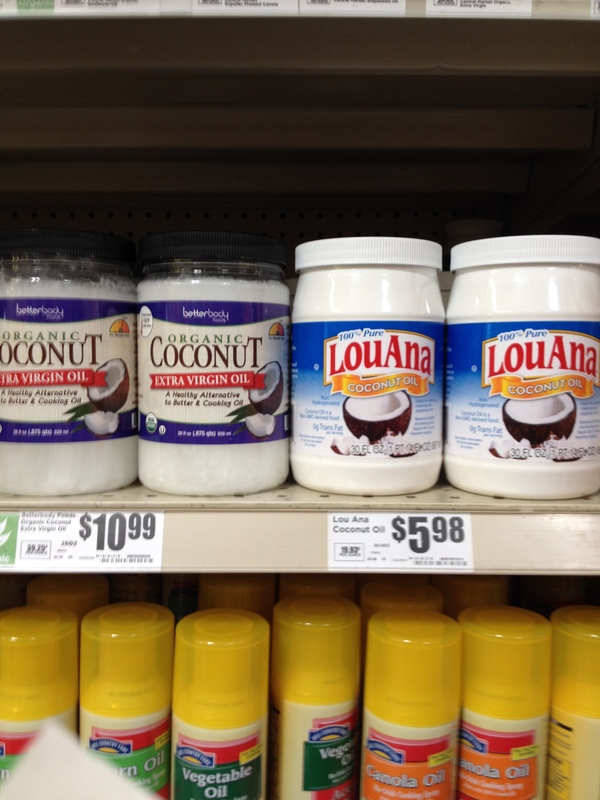 I’ve been buying LouAna’s coconut oil for several years. I called the company one day and it is NOT hydrogenated, although it has no coconut taste. When I started buying it, the price was, no kidding, $1.98 a quart. As its popularity has grown, so has the tab. I mean, overnight the price kept going up to where it is now. I’ve seen it as much as $7 a quart in Kroger. Remember too that the one next to the LouAna is the kind that you get in a health food store–extra virgin organic, and all that. Central Market has its own brand, as does Kroger, but it may be repackaged Tropical Traditions for all I know. With more and more people looking for healthier options and alternate ingredients, it’s available in more and more places, as well as online. Even if you live out in the middle of nowhere, if you can get mail or UPS, you can get some. And you thought coconuts were just for tropical drinks! Now you know more than you did before on the benefits of coconut. Next week there might be a new weight loss pill made from coconut, but I’d rather just eat it. So there you have it, Ladies and Gentlemen, a quick primer on the various uses and benefits of coconut–beyond what the Wall Street Journal told you. It’s not just for candy and daiquiris anymore, so enjoy some when you can, if not for sweetness, for its health benefits.